Eye bags, I used to say, I don't have it! But since turning into a mom and taking up so much responsibilities, I knew my "bags" are crying for help! Excess na excess na siya guys! So one makeup product I'm really consistently finishing up...CONCEALERS! I have tried, used and reviewed so many concealers, from the most inexpensive to the most expensive ones! I don't discriminate, if they work, I don't care if they are only a couple of hundreds as opposed to thousands of pesos! Recently, All-NEW Céleteque DermoCosmetics, came up with their own makeup line! I have tried their concealers back then but this one is unique! It is called the 2-in-1 Eye Bag Miracle Kit and I tested it out almost immediately. Fast-forward to 2 months after, I'm ready to share my experience. Left side facing you, wore Celeteque 2-in-1 Eye Bag Miracle Kit in Natural. Right side facing you - barefaced. "Is a two-component solution to the dark circles under your eyes that may be caused by poor sleep, allergies, hormone levels, or even the food you eat or the genes you’re born with. The kit contains an Eye Balm to reduce puffiness under the eye and an Eye Foundation in light, natural, and beige shades to cover and lighten your eyebags. Ingredients include the trademarked Cytobiol Lumin-eye to reduce puffiness and under-eye bags; Tocopheryl Acetate (Vitamin E) to nourish, hydrate, and firm up the skin, minimizing lines under the eyes; and antioxidants like Ubiquinone, Squalane, and Ginkgo Biloba leaf extract, all of which help prevent further skin damage." In every makeup training/workshop that I do, I highly recommend everyone to use an eye cream prior to using a concealer especially since the area tends to be the most drying part of our face! That area does not produce oil like other parts of our face so I'm glad Céleteque DermoCosmetics took some action and created a nifty pot that comes with an eye balm. The Eye Balm is a clear (almost lip balm-like) product that is meant to be applied before concealer application! Do you still need to use your eye cream before using this eye balm? I've tried both, you can use both! But if your concealer tends to slide off, choose just 1! As for the concealer, I got the shade Natural which is a good match for me. 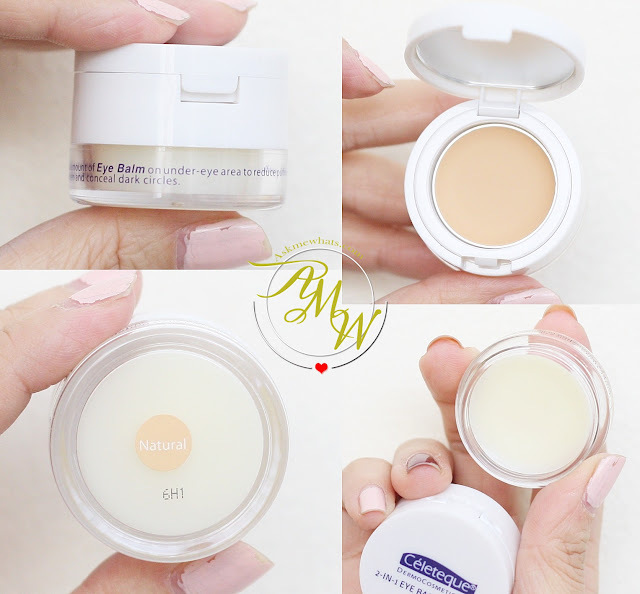 The pot itself is very small, you twist the white cap and you get the eye balm, and you flip the cover to reveal the concealer side. I like to use my fingers in applying the eye balm. (Sorry for the ugly nails, I am testing out a polish). For application, I like to apply only a few amount with patting motion. Letting the product "set" into lines and wrinkles. I like to wait for a minute or 2 for the product to settle down before I proceed with concealer application. Natural has more of a "yellow" undertone than "orange". So if you have extremely dark undereye circles like I do, it may not do the best in covering darkness, you may opt to correct it first with your choice of corrector and apply this one. For the sake of review, I used only Céleteque DermoCosmetics 2-in-1 Eyebag Miracle Kit Concealer in Natural. The concealer did a good job in "brightening up " the area but I prefer to correct it first as it may highlight the puffiness around my eye area. As for the Eye Balm, it does good in keeping dry spots at bay! I like how the product fills in the lines so the concealer doesn't look cakey or dry on me. I think I'd go for the shade BEIGE (they offer Light, Natural and Beige) to counteract darkness around my eyes! But it does a great job in lifting my face! 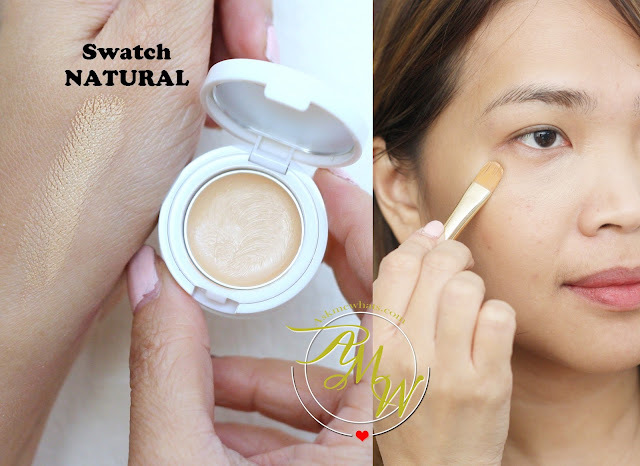 To you my AMW friends who have issues with dry concealers, you may give this a try! Céleteque DermoCosmetics is available at Watsons nationwide. For more brand and product information, visit http://celeteque.clickhealth.com.ph . How do you find this 2-in-1 Eyebag Miracle KIT? Do you think it is meant to be a concealer or eye brightener? Is beige better for darker circle? Can you use the balm as a night eye cream?